Hello! My name is Tristan Miller. I live in central New Jersey with my wife and two children. We're all active in taking care of the chinchillas and we're now focusing on standard and black lines. I no longer believe in breeding the weaker mutations, as I'm really trying to breed for the best chinchillas possible! We always have some for sale! I have kept Chinchillas since 1990 and I started breeding in 2004. I've always loved their personalities and mannerisms and I saw breeding as natural outlet of my growing interest in chinchillas. I currently have just over 50 chinchillas, assembled from some of the top breeders in the country. 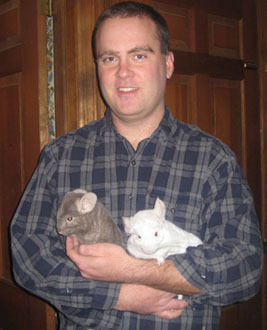 I created this site to share what I've learned over the past 18 years, combining it with the expertise of others, as well as bring others together to create the best resource for chinchilla owners on the web. Please share your knowledge! And let me know if there is anything you'd like to see added. Hope to see you at a show soon! I created this site with SiteSell. If you've run across any of those bogus reviews about Sitesell, go to this Site Build It Scam website to get the true side of the story. Help others learn about this site! Link to us! Just copy and paste the code below into your own site. The Chinchilla Source - A community for those interested in chinchillas. Practical tips, care information, product reviews, pictures and stories!